Learning how to play Jazz guitar can often seem like a difficult task, to say the least. On top of that, there are endless lessons, DVD's, books, and more to sort through. For many players, the hardest part about learning jazz guitar is knowing where to start. If you’re unsure of where to begin, or are overwhelmed with the amount of material out there, then this eBook is exactly what you’re looking for. for guitarists of all levels. Each day has 3 levels of exercises, laid out as Stage 1, Stage 2, and Stage 3. 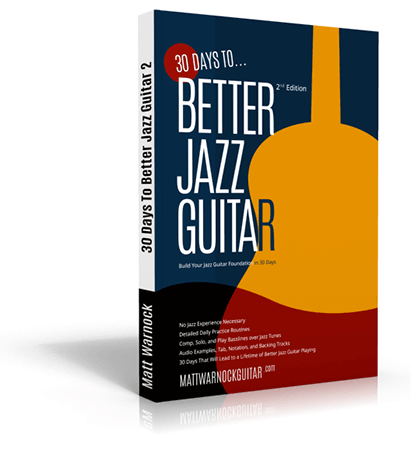 "What if I'm not happy with the 30 Days to Better Jazz Guitar eBook?" I have been working away at it, and have learned a lot. It is very helpful to help give some direction to my practicing. It's been a great kick start for my beginning level, giving some sense of progress. The course is very systematic and in a good pace. Everything is explained. It is exactly the book I needed to get any further. I use it every day. Thank you! And yes, in 30 days you can understand Jazz, amazing! I have done the 30days. Like what the page described, you can find tremendous amount of materials in the internet, no doubt but the issue, its just too much. This book tells you how to start in an organized way. Perfect for newbies and I think its a good book to intermediate player as well because it documented the 'standard' of how jazz being constructed. Not only learning from the internet piece by piece, it helps you to understand why people improvise from these fingerings, whats the tension behind, etc. Absolutely worth the money. One comment maybe I need more licks and examples, maybe you can demonstrate a song and explain how we can relate these concepts? This is awesome. This is a great book. The material and layout is comfortable to work with and the content and subject matter presented will improve your playing and understanding of jazz. One improvement I'd like to see is that the contents page be revised with links so that you can click straight through to Day 16 (for example). Other than that, great value for money and the backing tracks are a real bonus. One of the best instructional books that I have tried so far. The structure is excellent taking a step by step approach and providing clear examples to follow and adapt. Thanks! This is just what I needed a structured approach to learning Jazz Guitar, clear instruction and audio examples every step of the way. "Yes" and "me too" to all the positive comments. Coming from a folk and classical guitar background there are moments when I feel at a bit of a disadvantage with a nylon string instrument and playing using my fingers. Anything above 12th fret is a challenge to get clean tone, so I would have preferred to start somewhere in the middle of the fretboard rather than launching straight into 13th fret in Exercise 1. The 30 Day Book is one of the best I've seen in communicating the material. It is really well organized and structured which helps my learning and understanding. I've doing one lesson a week and I'm really enjoying what I'm learning. Matt and Dirk have the best online jazz guitar training materials I've seen anywhere on the Internet. Thank you for another outstanding product. I recommend this book to anyone wanting to learn more about jazz guitar. It's been especially helpful to me coming from a rock and blues guitar background with not much music theory. Thank you. Excellent, clear experience work for daily practice, be sure i need more then 30 days to practice the exercises in all keys, but it is a good training and investment for the future in playing jazz, thank you for this book. It's clear it makes me win a lot of time. I just received the book and went through 6-days of instruction. Great stuff! It has improved my understanding of jazz theory and helped me become more competent as a guitar player. Can't wait to get to the rest of it. I love the material in this book. It is like all the material on this site: first rate, well presented, and will definitely take you to the next level in your playing. I like it how the pieces of the puzzle fall into their pkaces. Excellent book. Thank you! Hi Dirk, Very much like the book and working through it slowly. I think the 30 days is optimistic!! On the one had 30 days brings some hope but on the other hand the 3 levels I found a bit dispiriting ... I'm working on a book on the guitar tuined in 5ths - low - CGDAEB -high- so am finding your book an inspiration. However I'm doing 3 versions, one for each Stage to avoid putting off beginners. Thanks again for a thorough and practical approach at a fair price. I found this book very clear and easy to follow; I'm still hacking my way, as I'm self taught on guitar (my second instrument) but that is no reflection on the high quality of the material or its structure. Just started this ebook, but so far very impressed. Simple, methodical approach to gradually building jazz guitar smarts. Really good teaching approach. I've never seen a book structured this way...with three levels available to the student. It works for me, and the lesson content is well thought out, as are all of Dirk's lessons that I have seen. I probably have more than a hundred guitar books purchased over many years, and all have limitations, often severe. This one is a keeper.